BoA Travel House Halal Dosirak Menu. Click here for full size. 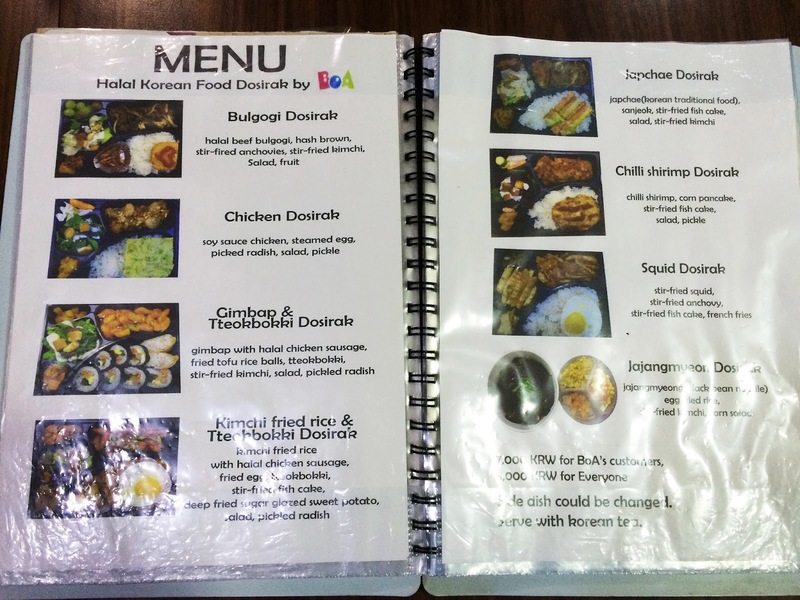 We ordered a day beforehand by checking their Menu online and messaging their Facebook page, Halal Korean Food Dosirak, Hongdae of Seoul. 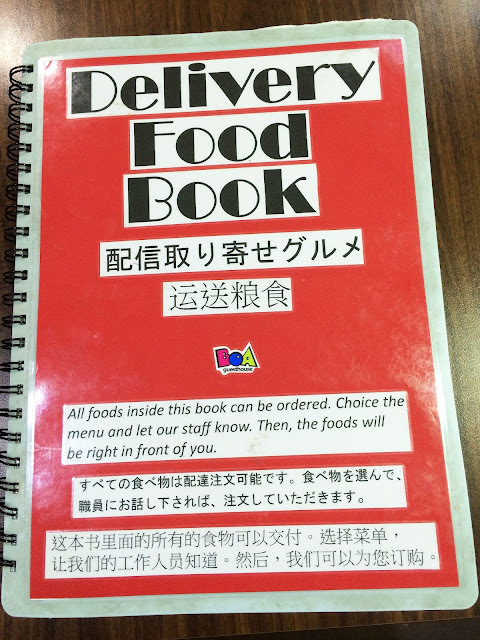 They were incredibly responsive, kind, and helpful, answering all of our questions quickly over Facebook and even being patient with us when we got lost and arrived late to pick up our order! We were greeted by friendly staff at the front desk and ushered to this charming room which seemed to be a combined dining room, recreation centre, and kitchen all in one, but more on that later. First up we had the Kimbap and Tteokbokki Dosirak which amazed me in how perfectly it looked like the pictures on the menu. Even though Kimbap looks like sushi, it's sort of like the "sandwich" of Korea and has way different ingredients and flavour. This was delicious! It had halal chicken sausage, carrot, egg, pickled radish, and was crunchy and tasting of sesame oil and just awesome. It was way better than I imagined! Tteokbokki is a popular street food in Korea, and this was my first time trying it. It's kind of a thick rice noodle that's chewy, spicy, a little sweet, and really filling. Then there were two Banchan (side dishes) which were tiny little hard boiled eggs cooked in soy sauce, and a refreshing corn salad. Both tasty! 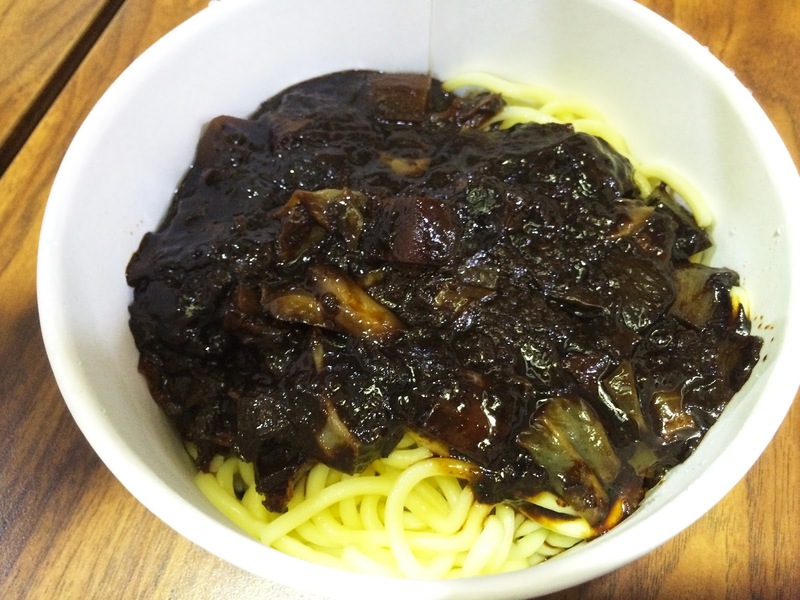 Next up I wanted to try the iconic Jajangmyeon, a black bean noodle dish. This dish is eaten commonly in Korean culture and is talked about all the time, but the problem is that it's cooked with pork! I was really curious about the taste because I've never seen anything like it. 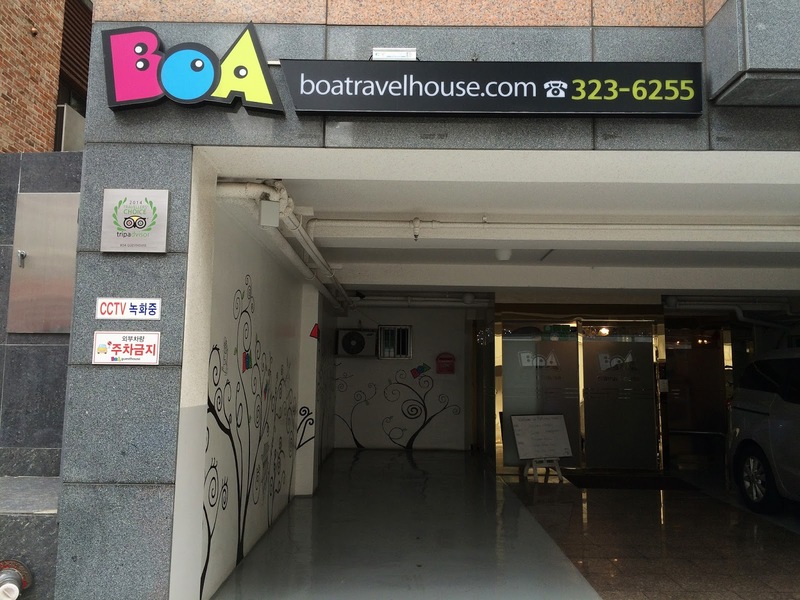 BoA Travel House to the rescue! They made a halal version using halal chicken sausage as a substitute for pork and I finally got to try it. 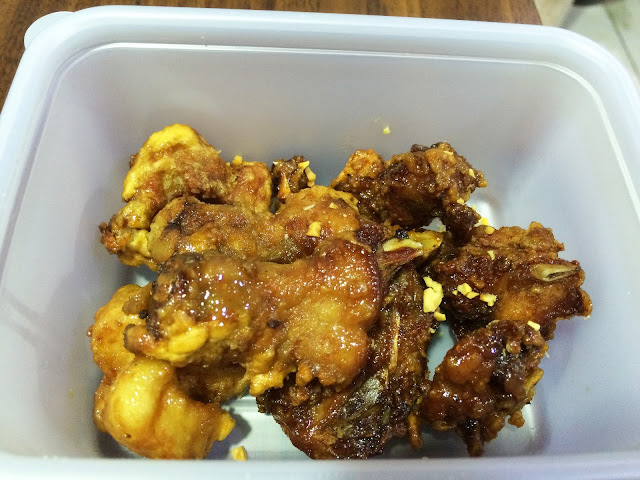 It has a mild flavour, kind of like a thick, non-salty soy sauce, and was definitely addicting. I understand why people eat it all the time, now! 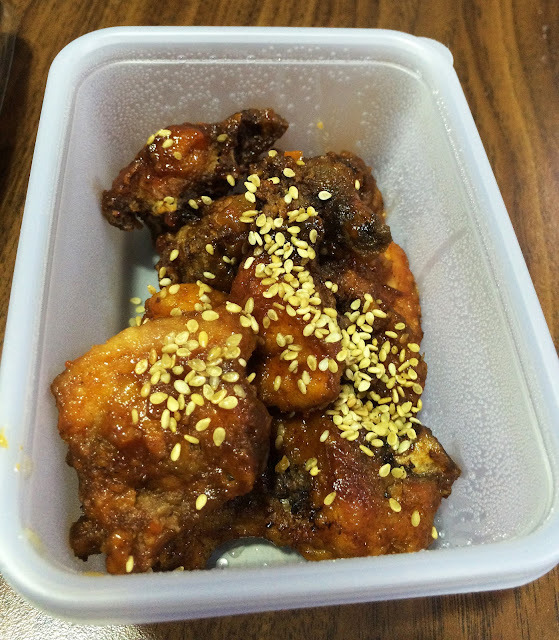 Along with the Jajangmyeon came these side dishes, which were little cubes of pickled radish (very refreshing! 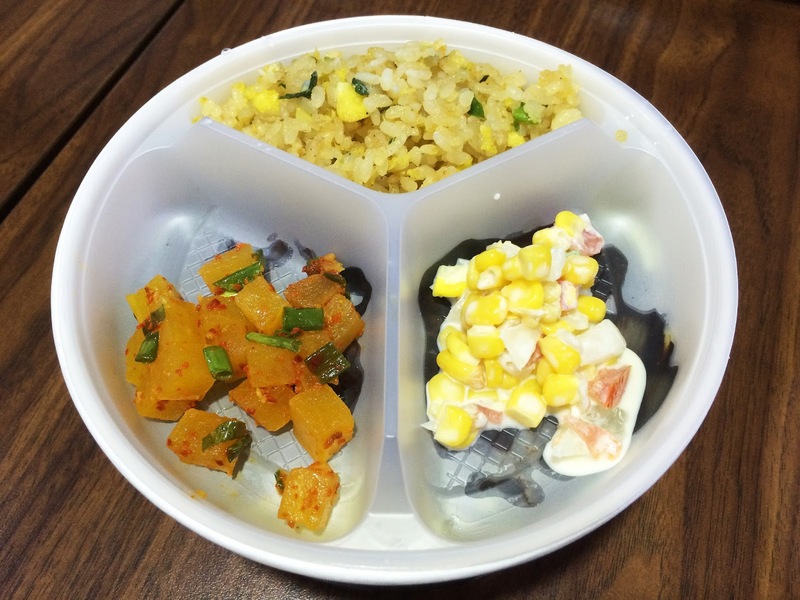 ), some fried rice, and the same corn salad as the previous lunchbox. Next was trying out the famous Korean fried chicken that is revered across the country, called "Half-Half Chicken" on their menu. The interesting thing about their style of chicken is the way it's cut. 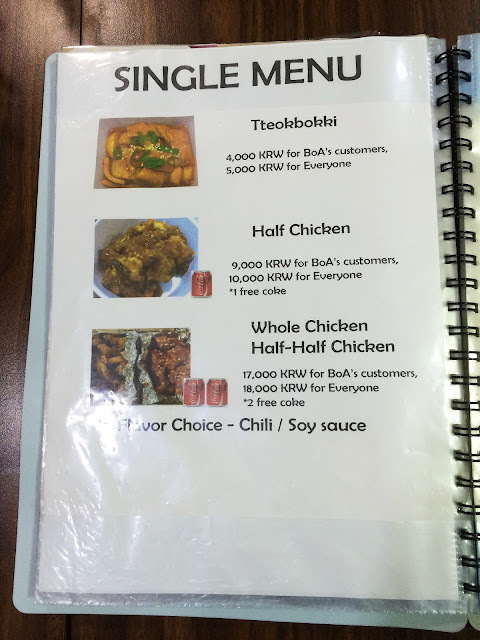 The chicken really isn't separated in the traditional way you'd see at your local fried chicken place, but instead has bony bits all over the place, so it's truly a finger food. There were two kinds, Chili and Soy sauce, and though both were delicious, the Chili style was the winner in my opinion. Along with this meal we were served two cups of lemon tea, and after finishing our amazing meal we set about exploring the incredible room we were in. 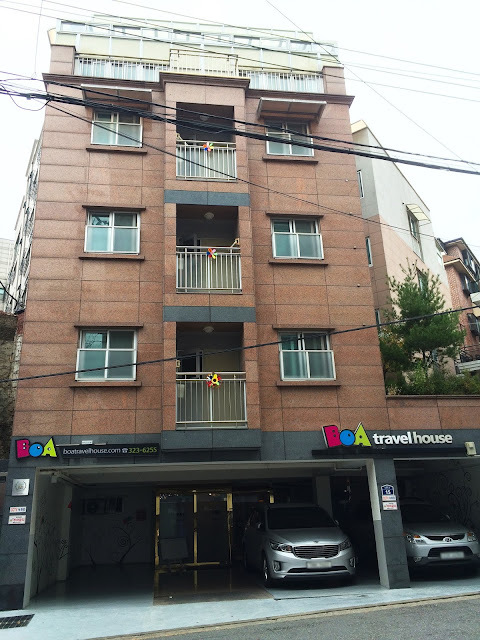 We found out that this hotel / travel house was incredibly Muslim-friendly and a popular place to stay for Muslims around the world, but especially from Malaysia. We didn't stay here, but the walls of this room are full of pictures of Muslims guests, and on their website we discovered they even have a Prayer room! 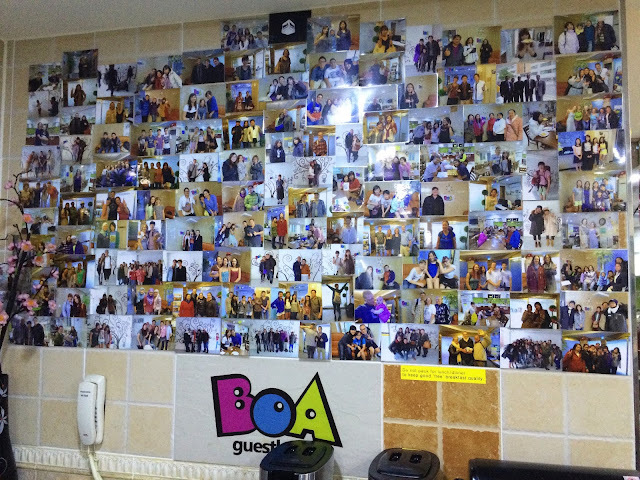 All over the walls of the Dining area were little notes and pictures of guests who had stayed, and you can really get the feel that they practice the utmost care for them. 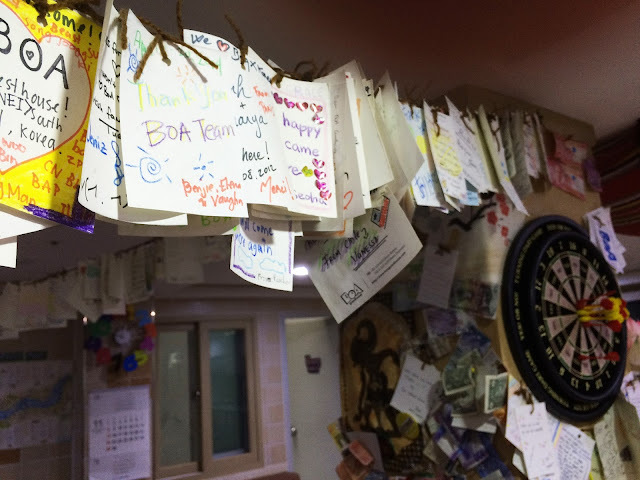 There were hanging garlands with hundreds of thank you notes from guests. 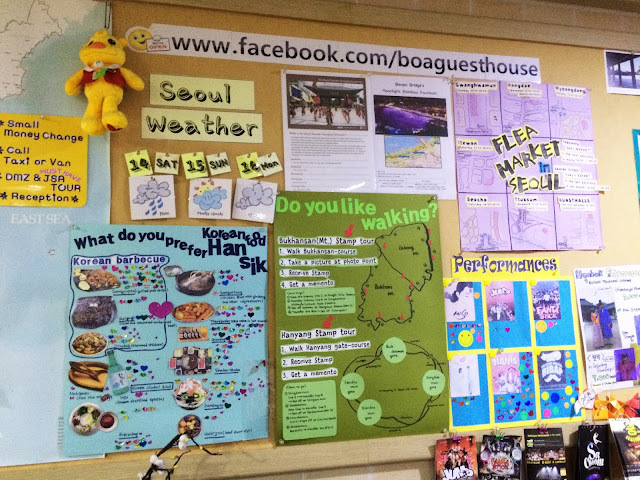 They had cute little information boards with a world map of guests' nationalities pinned to a world map (there's been tons of visitors from Canada, by the way!). There were tons of posters available with tourist information. 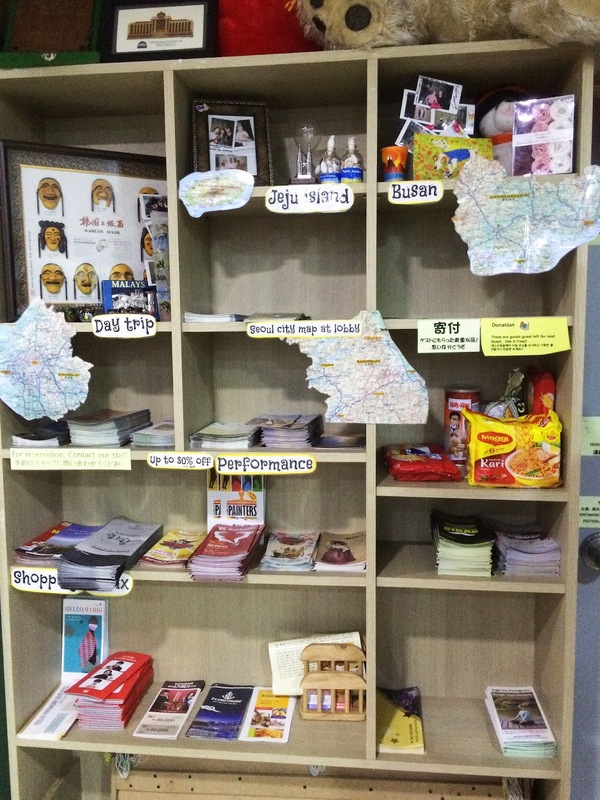 Along with an awesome stash of resources for day trips and other tourist sites in Seoul. BoA Travel House boasts rave reviews and awards from TripAdvisor, Hotels.com, and other travel sites, and now we completely understand why. 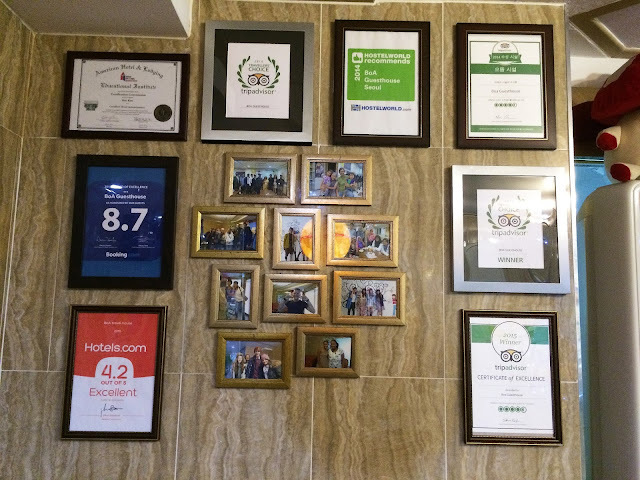 Even though we didn't stay here, we now know that we'd be right at home in this place with the incredible care and accommodations they offer Muslim guests. 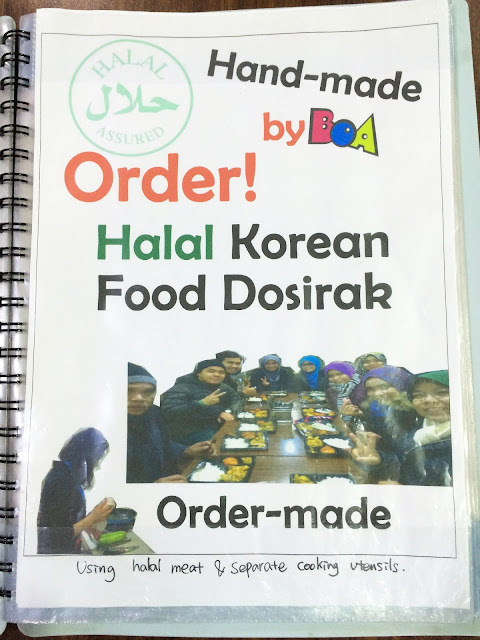 We had a wonderful experience with BoA Travel House's delicious Halal food as well as lovely hospitality, and we would love to stay there next time we visit, as well. 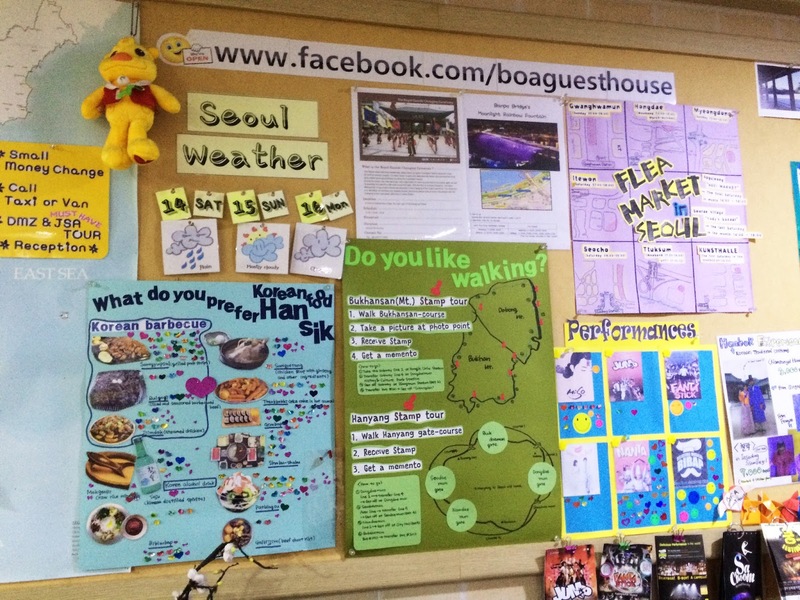 and be sure to Like our Facebook Page as well! We're glad you found them okay and had a chance to try their food! How was it? What did you order?